Myths were stories told to explain the natural world. 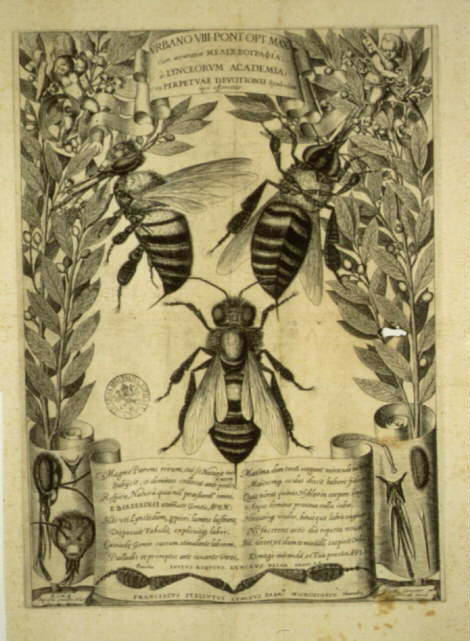 Bee mythology is found in many ancient cultures where honey was hunted and bees were considered a gift from the gods. 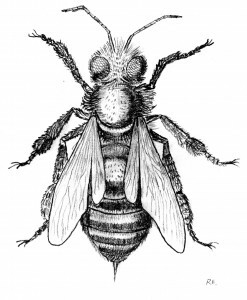 Each myth explains something about honey bees and beekeeping. Bee was a kindly creature. One night, Mantis needed to cross a great, flooded river to reach his family, and asked Bee for help. Bee offered to carry Mantis on her back. She flew over the raging waters but was beaten down by a strong wind. Bee was dangerously close to the waves when she saw a magnificent flower floating on the water. Bee dropped Mantis onto the flower, fell beside her, and died of exhaustion. When the sun rose, curled up on the flower was the first human being – Bee’s sacrifice. 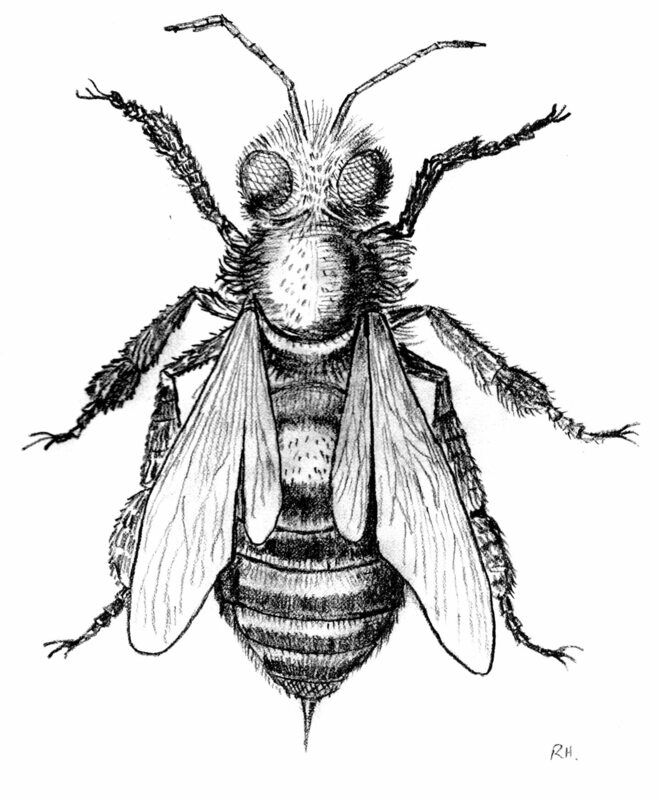 Note: my bee picture is based on Stelluti’s Bee, the first ever microscope drawing. One day, Honey-Guide flew to visit Beetown. He demanded that the Bees give him a wife. The Bees thought about this for a while, but then said no. Honey-Guide was angry and said he’d tell the humans where they lived. Ever since then, when he sees people passing by, he tells them where to find the Bees. In the beginning, honey was found in huge pots on the ground, and people ate as much as they liked. The gods looked down and were greatly displeased. “Those humans are becoming fat and lazy,” they said. The gods commanded the bees to build honey comb high in the tall jungle trees. Now people had to work hard to climb up and get the honey. Long, long ago, elephants did not have trunks. One day a terrible forest fire swept over the land. To escape the smoke, the honey bees hid inside the elephants’ mouths. The elephants roared angrily, but the bees would not come out. The elephants blew so hard, their mouths stretched out into trunks. In desperation, the elephants breathed in the stinging smoke of the fire and the bees finally buzzed off. Since then, bees have always built honeycomb in hollow trees, because it reminds them of elephant trunks. One day, Bahloo the Moon Lady looked down from the sky and saw the honey hunters. They took their axes, split a tree open and pulled the honey comb out. She knew the hunters always left a sweet treat behind for her. Sure enough they put a chunk of comb in the fallen tree trunk and then left. Bahloo swept down and put her arm into the tree. But her arm got trapped and she couldn’t move. Bahloo heard a strange noise and turned to see many tiny Grass People approaching. They freed her arm so she could return to the sky. To reward their kindness, Bahloo sends dew drops to the grass every night. In the early days bees lived in hollow trees and they built khani zambure (wax comb) to store the honey. They had just enough honey to feed themselves. One day a human discovered the bees’ small factory and decided to build the bees a better one. He made blue and white boxes and the bees loved living in them. They had space to store enough honey for themselves and for the human. And a great many workmen working at that. Yellow are their toes, yellow are their clothes. Tell me this riddle and you can pull my nose.